NDO/VNA – The European Union (EU) and European countries have been carrying out a number of climate change adaptation and sustainable development projects in the Mekong Delta of Vietnam. The biggest partners and donors are the EU, Germany, France, Denmark, Sweden, Hungary and Romania, according to the Foreign Ministry’s information released at the Asia-Europe Meeting (ASEM) Conference on Climate Action to Achieving the Sustainable Development Goals – Ways Forward in Can Tho on June 18-20. Specifically, the EU implemented a project building a sustainable tra fish (pangasius) supply chain from April 2013 to March 2017 with total investment of EUR1.9 million (US$2.2 million) and another conducting scientific studies on climate change and coastal erosion in Quang Nam, Ca Mau, and Tien Giang provinces in 2016-2017 worth EUR1 million (US$1.15 million). The EU also carried out a EUR108-million Energy Sector Policy Support Programme to increase access to sustainable energy in rural, mountainous, sea and island areas in Bac Lieu, An Giang, and Can Tho. 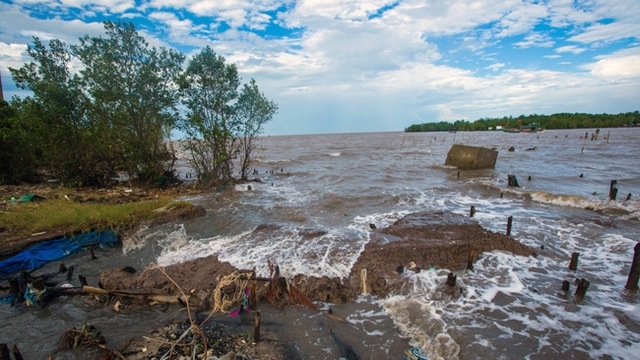 In Ca Mau, the German and Australian governments co-financed VND68.39 billion (US$2.9 million) in ODA for a project under the Integrated Coastal Management and Climate Change and Coastal Ecosystems Programme (ICM/CCEP) and authorised the German development cooperation agency (GIZ) to implement. The German government also provided Ca Mau with EUR1 million to implement a project on restoration of mangroves through sustainable shrimp farming and emission reduction. Ca Mau province is also making preparations to carry out a project combining coastal protection and mangrove forest land restoration using loans of about VND331 billion (US$14.5 million) from the German development bank KfW. In Soc Trang province, the German government is carrying out the second phase of the project on natural resources management in coastal areas from September 2014 to August 2018. Germany also provided a non-refundable aid package of EUR5.1 million (US$5.9 million) for Bac Lieu province to conduct two projects on the sustainable management of coastal ecosystems, second phase from 2015 to 2018, and on climate change adaptation through promoting biodiversity. Meanwhile, the French government offered EUR52.35 million (US$60.6 million) in loans, including EUR1 million in non-refundable aid, for the implementation of a project enhancing climate change resilience for areas prone to extreme climate patterns and rising sea level in Can Tho city along with Ninh Binh northern province and the central province of Ha Tinh. The Danish government supported Mekong Delta provinces to cope with environmental changes through the national target programme on climate change in 2009-2015. Denmark has become the biggest donor with around US$40 million in assisting the Mekong Delta, especially Ben Tre province, in piloting measures to prevent saltwater intrusion prevention and climate change adaptation models such as building flood-proof houses, irrigation networks, salt-to-fresh water treatment factories, and automatic rain gauging stations, contributing to the improvement of the natural disaster warning system. The European country also spent over DKK4.3 million to provide water by renewable energy in 2012-2014 for rural areas in 12 provinces in the Mekong Delta. From 2011, the Danish government has supported Vietnam’s Ministry of Agriculture and Rural Development to implement a project assisting the agricultural sector, including the improvement of post-harvest services for households in the Mekong Delta, which increased the proportion of dried rice to 31% of total output from 13% in the previous time. In An Giang province, the Swedish government implemented a project enhancing local capacity and building a scheme for the development of rice husk-fuelled thermal power plants in combination with rice milling plants in 2014-2015 with a budget of nearly EUR345,000, including nearly EUR105,000 in local corresponding capital. The Romanian government carried out a project piloting the establishment of a biodiversity conservation site for sustainable eco-tourism development in Ba Tri district of Ben Tre province.